Hope you’re having a great weekend and welcome to the chaos! (Like you needed more, right?) Chaos with a capital C. I’ve mentioned we’re in kitchen remodeling mode around here. We’ve been selling off our current kitchen piece by piece on Craig’s List and the stove went Friday. Buh bye. The good news is a local friend knew our plight and offered the propane fueled stove top they used during their recent kitchen remodel. Plus we borrowed a six foot table and put that in the middle where the island was. So it’ll be camp style cooking for a while, which is certainly better than a fire pit out back I’m thinking. So we’re getting ready to install our new kitchen. The contractors arrive tomorrow to start wiring, connecting the gas line and repairing sheet rock. Jon has carefully ripped out all the old kitchen cabinets and tile backsplash and they’ve been clogging up the garage. Yesterday the cabinets departed (as I cheered!) with a Craig’s List buyer. The new ones arrive tomorrow. Timing is everything, yes? Today I’m sharing some random pics and thoughts, and in a few weeks when we’re finished I’ll share more. 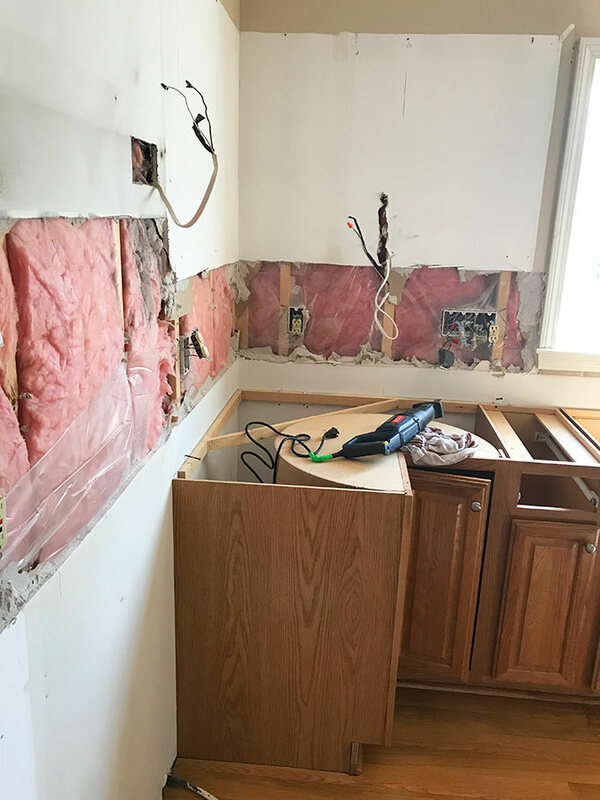 It’ll be a fun kitchen reveal and the truth is… I can’t wait to see how it turns out myself! I’ve had some ask why we’re doing a remodel since the kitchen is functional. Yes, it’s functional. I, however, am not a utilitarian girl. Form over function. Big surprise. (And why not form AND function anyway?) I’m a lover of beauty with a B.A. in interior design who enjoys hunting down a good deal and transforming old and outdated to fresh and new. I’ve dreamed for a long time of designing a kitchen from the top down, and finally after a lot of research – it’s time! 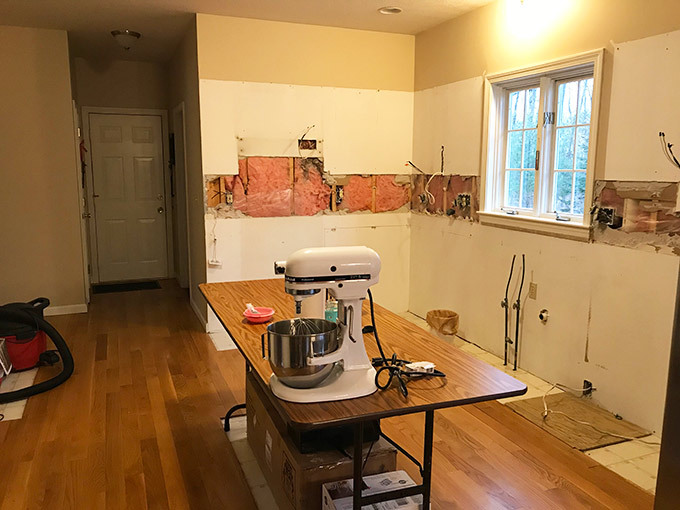 My kitchen as of today…. (!) Wish me luck. When we lived in the south in the 90’s, we bought a fixer-upper house by silent auction. The entire house needed attention, but especially the kitchen. As newlyweds, and no kiddos yet, we didn’t plan on being in the house longterm. 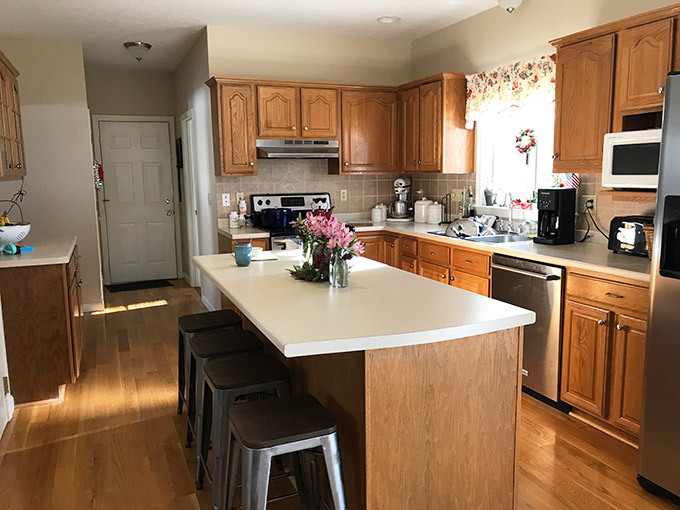 So we installed inexpensive appliances, painted the cabinets white, added new MDF cabinet doors and hardware, and replaced the laminate flooring. It was a cut and dry, simple kitchen update. And it helped us get top dollar when we put our house on the market in 2003 to move back to New England. With the cost of housing up here, we needed every penny. 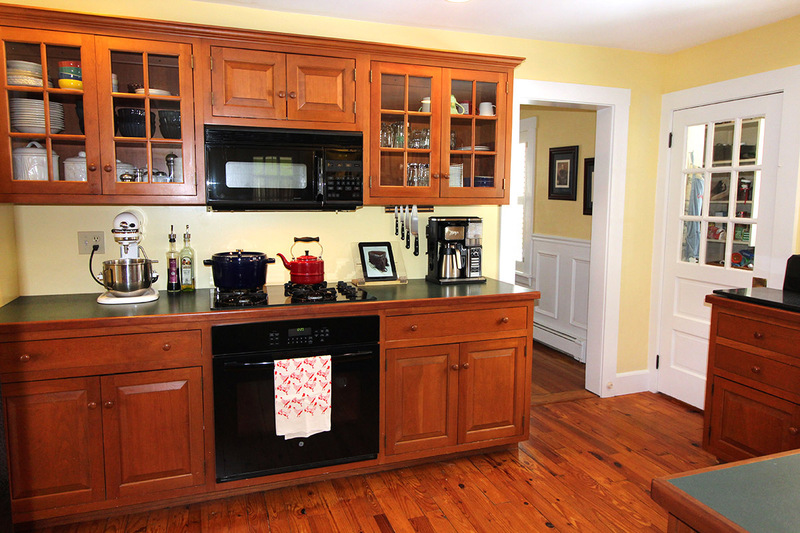 There’s no doubt about it, updating a kitchen adds significant worth and value to a home. 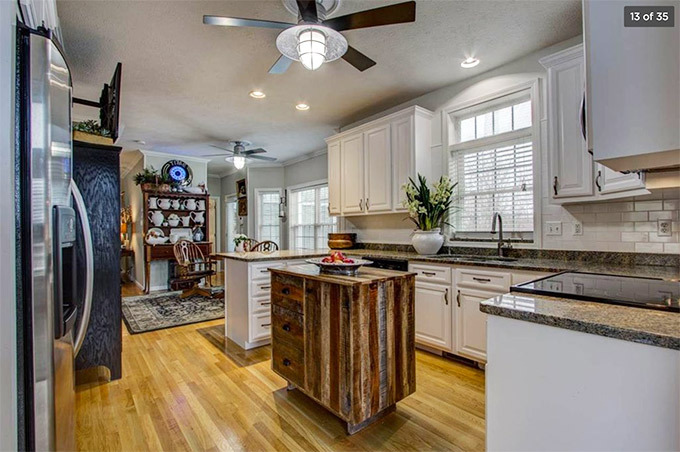 Check out which home remodel projects add the most value to your home. When we moved to New Hampshire in 2004, we rented for a while, then bought a sweet little ’40’s cape with a somewhat updated kitchen. 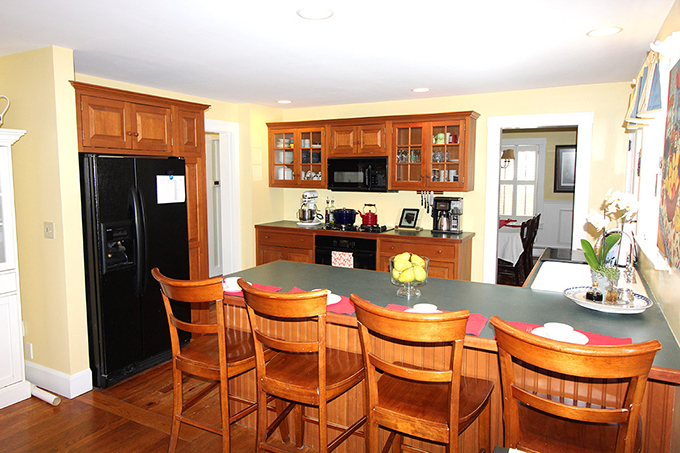 The cabinets were custom, built by a local NH shop, Crown Point Cabinetry. I loved those cherry cabinets. The negative of that kitchen was the green laminate countertops, which also darkened (and dated) the kitchen. But I loved that kitchen. The old, original wooden floors discovered by the previous owners underneath the laminate flooring contributed to the character. Because we were short on space and bedrooms, we finally made the difficult decision to put our cape on the market FSBO last spring. The housing market was pretty crazy at the time. 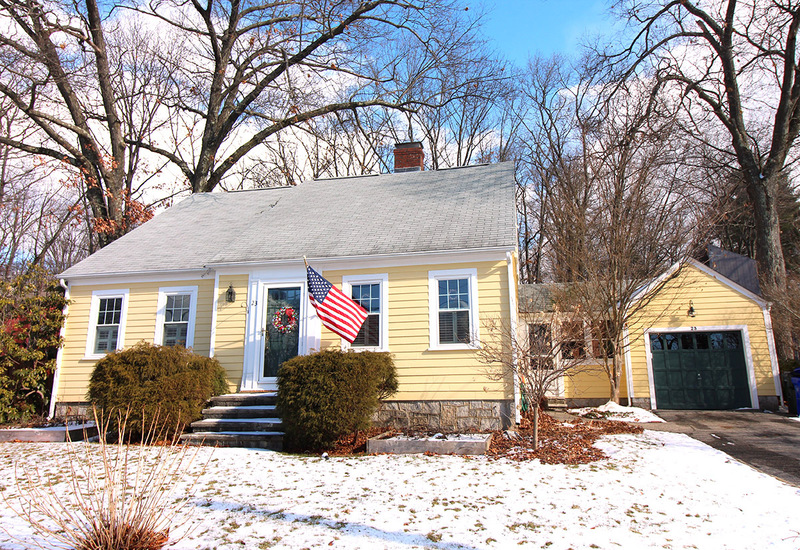 When flighty buyers pulled out from buying our cape at the last second, we lost a beautiful home we had a contract on. I won’t lie, it was pretty heartbreaking. The kitchen in the house we lost was light, airy and beautifully appointed. (Above.) The lighting was perfect for my blog photographs. I lost a few tears when we lost the contract on that house. Read: buckets. My sweet Jon promised we’d find another beautiful house. We moved into our new-to-us house in July of last summer and have been living here for eight months now. I highly recommend living in a space for a while before starting any major remodeling project. Living in the space helps you figure out whether or not it works well for you and your family, work (esp. if you work at home like me) and entertaining needs. Helps you know what you like and what you don’t. And what needs to change. The kitchen in our new house is adequate, but needs updating. The oak cabinets are builder grade from ’96. Some of the roll-out drawers didn’t. roll. out. LOL. There’s a small pantry 18″ wide for our family of six. 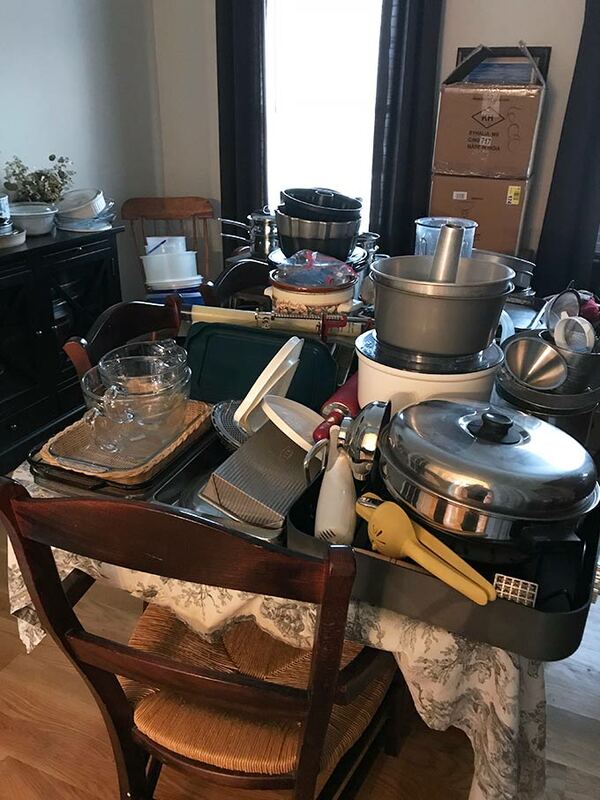 The cabinets weren’t in terrible shape, but there just weren’t enough of them to store all the dishes, pots and pans. The ceilings are tall, over nine feet, but the cabinets only went up about 2/3 of the way to the ceiling, wasting space. The tile backsplash above the countertops were neutral, but dated, as were the laminate kitchen counters. The kitchen sink was dented, with shallow bowls. And don’t even get me started on the faucet sprayer. The button was permanently stuck on spray, nailing you in the face whenever the faucet turned on. Think (ice cold) wake up call first thing in the morning before coffee. Eek. (I finally got wise and rubber-banded a plastic bag over the sprayer.) I’m not sorry to say goodbye to that unpleasant Gestapo greeting. So for these reasons and many more, we’re excited to begin. I’m looking forward to a lighter, brighter look and feel in our new kitchen. I’ll post a kitchen idea board so stay tuned if you like that kind of thing. Remodeling is a lot like wallpapering. It has to get worse before it gets better. You gotta strip down the old before you can prepare surfaces and get rolling with the new. We had this done last spring Allie because Lord willing we will leave this house feet first or on our way to a nursing home. Love my new kitchen right down to my soapstone counters and farmhouse sink. It is truly a blessing to go in and work in such a beautiful and functional space every day. Hope you are all well, even with the disruption! Thanks Elise! Madeleine told me you remodeled your whole kitchen and she told me about the soapstone. (!!!!) So fun,and happy for you. So glad to hear you are loving it and enjoying working in your kitchen. It's so important. We spend so much time in the kitchen it makes sense for it to be beautiful and functional too. I'd love to see pics of your kitchen some day. I really wanted a farmhouse sink also, but had to weigh how all my boys might treat a porcelain sink. I realized if it got chipped or scratched, it would be tough to take and I'd probably get pretty mad. Then I thought about maybe a stainless steel farmhouse sink and I realized I just didn't like the look as much and it would prob. get scratched by belt buckles etc. as people were washing the dishes... so finally I let the farmhouse sink go. I'm excited about a pot filler, a hot water dispenser and a double convection oven. And finally getting gas back for my stovetop. We had it for years and then this house had a smooth top stove, so it has been an adjustment. The heat on this smooth top isn't even, very hard to regulate. I was burning pancakes right and left. The gas cooktop can't come soon enough. :) Have a great week! Hope all goes well and quickly! I’m so excited for you, Allie! It will be worth every minute of frustration and inconvenience—can’t wait to see your beautiful new kitchen! Thank you so much Sue! Trust me - I'm looking forward to it too. The cabinets were supposed to arrive this morning but no sign of them yet. I think what I'm most looking forward to is getting a gas range back. We had a gas cooktop at our old house and I just didn't realize how much I prefer cooking with gas. Have a great week my friend! Having been through a kitchen Reno...it’s not easy but oh so with it! I’m sure your new kitchen will be stunning! I can’t wait to see. YASSS!!! And your results were absolutely amazing Elle. Your kitchen is gorgeous. 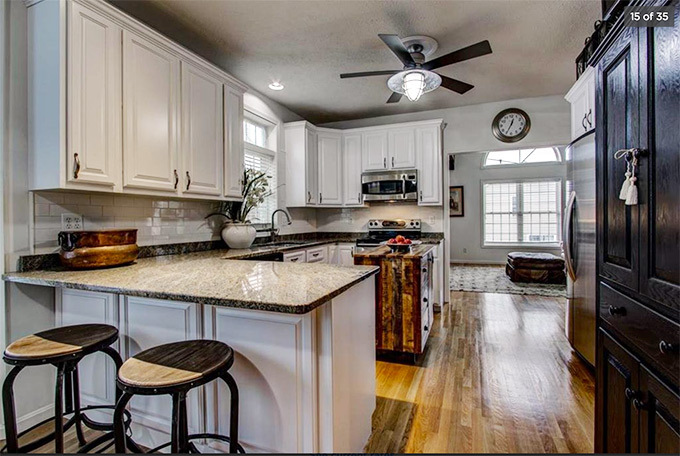 You know I thought about gray cabinets myself after seeing your kitchen, but I really needed the light and bright reflective for photographs... so many choices, it's dizzying. I too am in the middle of a kitchen remodel. We own a bed and breakfast inn. It has been 3 months that we've been working on this baby. I too am using a camp stove and microwave. Most of my kitchen stuff is on my enclosed front porch. Cabinets just started to go in yesterday. We open back up to the public April 1st. This has been a no fun situation. But I am looking forward to my beautiful kitchen in a month. Hey Barb - great to hear from you. And can't believe you've been without a kitchen for 3 months!!! That's tough. 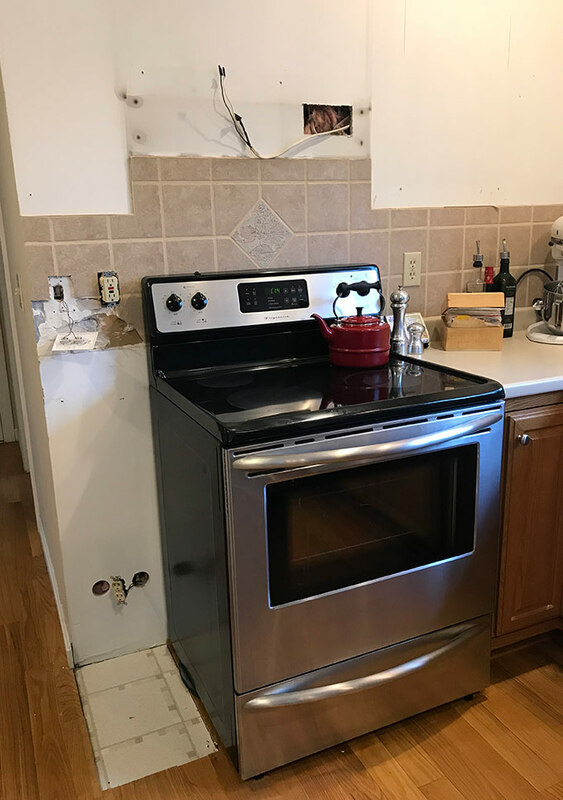 My aunt J in Wisconsin is re-doing her kitchen and I think she's out of a kitchen for about six months. They're knocking out walls and pushing their kitchen out into their patio area - it's going to be beautiful. I know yours will be too and sounds like you're getting close to done. Hope you'll post pics. on your site, I'll definitely drop by to see them. I don't know how long this process will take here - seems like about 2-3 weeks. Fingers crossed. 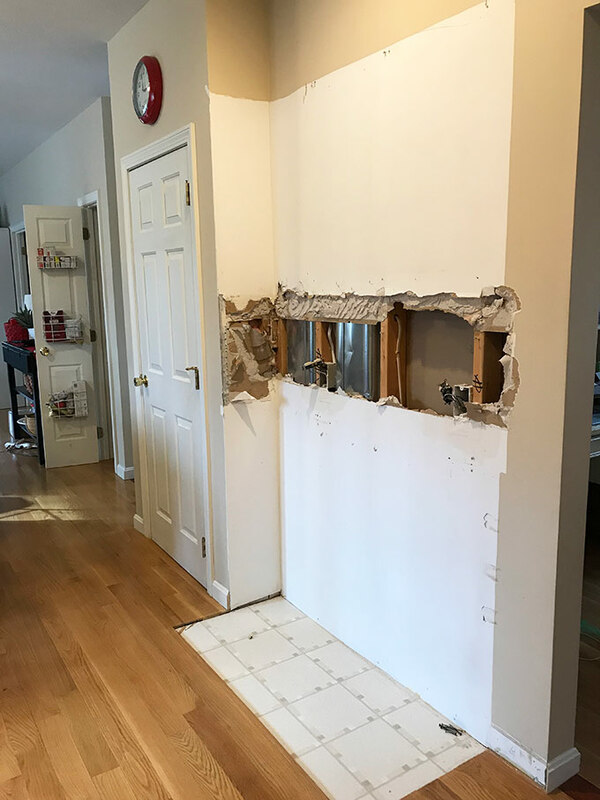 We did some of the labor ourselves - pulling out the cabinets and old tile. Jon will do the painting. Hoping to keep the wood floors. Best wishes on your beautiful kitchen and I hope it's finished very soon! So exciting. Not moving walls, but adding a pantry and a completely new configuration. Husband is a master plumber, so he is doing all the plumbing and other stuff too. Taking a long time because, he works another full time job. But we are contracting out a lot of the project. Wood floors are being refinished this week and cabinets measured for countertops. When we are done by April 1st, I will have pictures on my Facebook page. By the way, love your blog! How helpful that your husband is a master plumber. But wow. Working full-time too. I know it must feel pretty crazy now. Hang in there, hope you are seeing the light at the end of the tunnel. I will def. like your Facebook page and look forward to the pics. I searched for your facebook page at HoneyBee Inn but nothing came up. So maybe if you could share your FB page name that would be great. Glad you enjoy the blog, thanks so much. It's a lot of fun, especially meeting interesting people around the country like you. Put in Honeybee Inn Bed & Breakfast and it should come up. Or there is a link to our Facebook on our website. Thanks! ok thanks - found it - liked your page - looking forward to the kitchen pics. Your inn is amazing. You've done a fantastic job! So thrilled for you and your new kitchen, Allie! Can’t wait to see the results. Hang in there. I agree. Can’t wait to see it. Thank you Kate - knew you'd be excited! You've been on this journey from the beginning! And thanks Leslie... here we go! Hopefully it will be just a couple weeks, but who knows. Things come up. The countertop folks are supposed to be measuring this Friday if the lower cabinets are installed. Oh thank you Susan - what a journey this has been already. You are so sweet... I'm so thankful to be getting a new kitchen. Can't wait to see how it turns out and share the pics. Have a great week! Can't wait for final pics. One day at a time and before you know it it is done. Ha, that is our goal, to be done for Easter too! We have five grown kids, spouses and grandchildren, and they're all coming. 15 in all. They were all here for Christmas for a week, and that was fun on a camp stove. Three sons and two son in laws helped tear the old kitchen out then. Thank goodness we have a bed and breakfast inn with 6 bedrooms! This is funny Ali because we are both at about the same pace. By the way, I have new daughter in law named Ali! Perfect Barb! 6 bedrooms... love it. So nice all the men were wiling to pitch in - I'm sure there are some great memories. Very sweet, a family affair. What a big project!. Hope it goes smoothly and quickly! Extra prayers for your sanity! A new kitchen designed to your specifications, perfect! You may live out of a crockpot or electric frying pan, but it will be worth it. I have always wanted a stove top pot filler, I can’t carry large pots filled with water anymore due to arthritis. It might be worth installing one while the Sheetrock is exposed. Good luck and looking forward to more pictures! 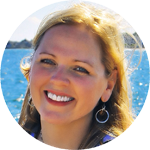 Hi Elaine - I loved hearing from you, thank you. In fact, I think of you whenever I get to that Stone Wall Kitchen outlet in Rochester - I've gone three times now. That has the BEST deals. I keep thinking I'm going to do a post on that but haven't gotten to it yet. I was so glad to learn that information from you about the outlet up there, and this past year I made Christmas gift baskets and filled them w/Stonewall items, and maple syrup from a friend who owns a maple syrup farm up in St. Albans. Everyone seemed to like the culinary gifts. So I'm sorry to hear your arthritis is keeping you from filling pots. That's tough. And yes, a pot filler is one of the bells and whistles I'm getting. They are starting the plumbing for that and working on the gas line for the cooktop and the electric for the wall oven tomorrow. Also a hot water dispenser at the kitchen sink. My sister has one of those and she swears by it. So you can make tea, oatmeal, hot cocoa etc. without heating it up on the stovetop. So things are coming along and thanks for the pot filler suggestion. I actually have significant bursitis in both my shoulders due to carrying Hudson for so long and sometimes I still have to carry him when he refuses to walk...so the pot filler will be important for me too. Enjoy the rest of your weekend, so glad you dropped by! Ooh, I like the idea of a hot water dispenser!!! Have to get hubby to put that in! We are getting a pot filler too. A friend of mine has one and loves it! Been doing this bed and breakfast thing for 16 years in a so so kitchen. Woohoo, looking forward to this being done. All my innkeeper friends say I'm going to love cooking again! Yes Barb - I'm so excited you'll get one too. It will be a big time saver at the inn for tea and other quick hot water needs. The one we picked out on Amazon has a 2/3 gallon tank under the sink and makes up to 60 cups of steaming water per hour, I don't know if that's enough for your needs there, but here's a link - https://www.amazon.com/gp/product/B01LR7AJOQ/ref=oh_aui_detailpage_o02_s02?ie=UTF8&psc=1 So excited for you. Sitting here catching up on the latest taped episode of Fixer Upper and an inspiring blog I love after dropping by David & Jenn's to see their new kitchen/family room remodel project underway at about the same spot you are. Have to smile at how well they all go together today. Sounds like you have excellent plans in place...can't wait to see the reveal and follow your progress. Super FUN! Allie, I am so excited for you. I can't wait to see it when it's finished. I want to redo our kitchen just not sure how much of a redo I want to do. Let me know if you want to borrow my instant Pot, (I love it). Thanks so much D - you know I'd love to help you think through that redo when you get to that point. (I guess, see my kitchen and see if you WANT my help. LOL.) It's been fun getting back into a design project, it's been a long time since we did one quite this extensive. I guess the last big one we did was when we finished off the basement at our last house. H and Chloe are not so thrilled about the saws and drills going. Wish it wasn't vacation week but we didn't want to run into Easter, which is early this year. As to the instant pot - thanks for the offer. Sadly I am completely ignorant as to how to use one. Isn't that funny for a food blogger? I have an electric skillet I've been using plus the microwave. We've had pancakes and tacos already, and chili is on the menu tonight. Plastic sheets are taped up over all the kitchen doorways to minimize the dust. Definitely a construction zone!